Quilting fabric is about 42" wide, so making a quilt that's 40" or narrower means you don't need to piece the backing as long as you have enough yardage to cover its length. Increase the quilt size as necessary for your project and learn how to make quilt backing for larger quilts. Our baby quilts finished at 28" x 34", a nice size for little ones. Cut twenty 4-1/2" squares of fabric for blocks. Press your fabric and cut eight 2-1/2" wide strips across the fabric's crosswise grain to use for sashing. Cut four 3" wide strips across the fabric's crosswise grain to use for borders. Place a 2-1/2" wide sashing strip right side up at your sewing machine. Align a square right side down along the strip's right edge, just past the selvage at the top. Sew the square to the strip with a quarter inch seam allowance. Stop sewing long enough to position a second square a little bit past the first. Sew the second square to the strip. Continue sewing squares to the strip until you've covered the entire usable strip length (avoid the selvage at the bottom end of the strip). Take your pieced unit to the ironing board and press the seams towards the squares. If squares are lighter than sashing, press towards the sashing. Continue piecing and trimming squares until all squares have sashing on one edge. Move to your cutting table and cut the units apart. Place a rotary ruler along a square, aligning rules on the cutter with the side and bottom edges of the square and letting it extend past the sashing. Trim through both (illustration). Use the same technique to sew sashing to either the top or bottom edge of the units. Be consistent so that blocks are alike (sashing will create an 'L' around the squares). Trim the second sashing to create the finished blocks. Arrange the blocks on a design wall or table, then sew together into rows. Sashing will separate all blocks and appear on two sides of the quilt top. Press seam allowances in adjoining rows in opposite directions. Sew rows together. Trim and sew sashing strips to the two remaining sides of the quilt. Sew butted borders around each side. Read the instructions on quilt batting and choose a product that doesn't need to be closely quilted to stay intact, such as Warm and Natural. Sew binding to the edges of the quilt or finish the quilt's edges more quickly using this technique, sometimes referred to as birthing a quilt. Arrange the quilt top and backing right sides together and place a layer of batting underneath the backing. Sew a 1/2" to 3/4" seam allowance around the quilt, leaving an opening along one side. Put your hand into the opening and turn the quilt right side out. Turn under the open edges and hand stitch to secure them. Quilt to hold layers together. We're usually concerned about fast production when we make comfort quilts, but finishing them quickly doesn't mean they should be stitched together haphazardly. Your quilt might be the only personal possession of the child or adult who receives it, so construct the project with care. Scrappy Floating Stars is an easy quilt block. You can make a quilt of any size quickly. Consider brightly colored prints if you're making baby quilts or quilts for older children. Consider making a string quilt from your leftover scraps. 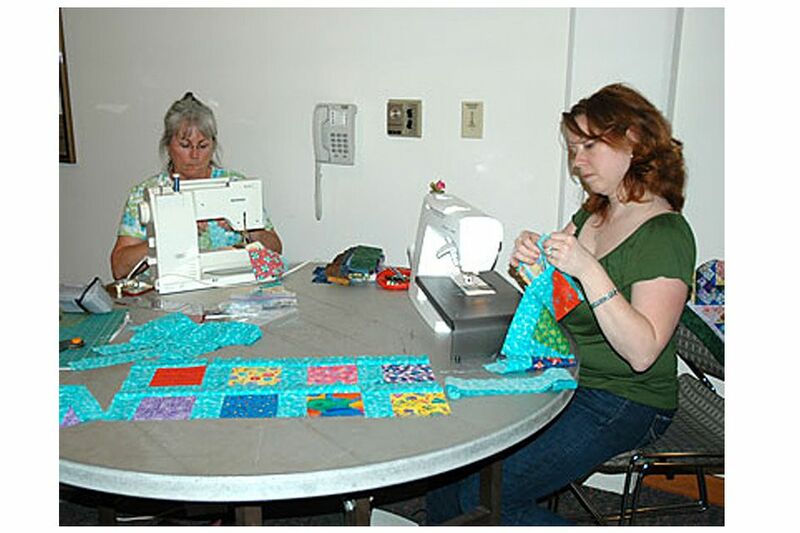 They're easy, even for beginning quilters, and require very little quilting. Snowball blocks are a good choice when you want to put together a quick quilt.